It is inevitable that around the holiday season we end up with leftover ham. We often serve ham for Christmas dinner and we love to make it for dinner parties. However, never once have we managed to eat and entire ham in one sitting. 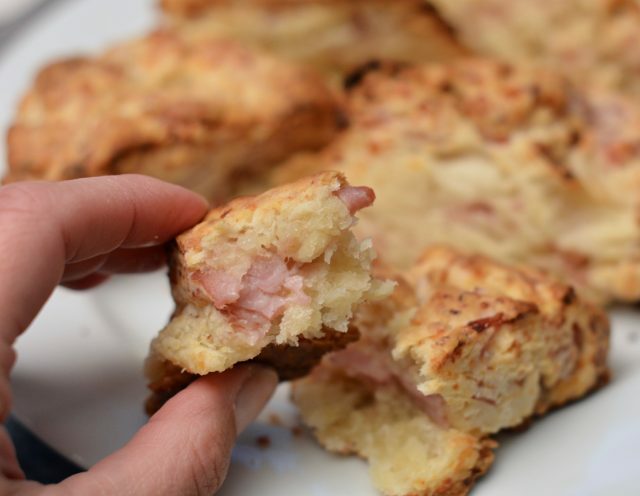 Over the years I’ve come up with different ways to use up ham in casseroles, breakfast scrambles, and more. 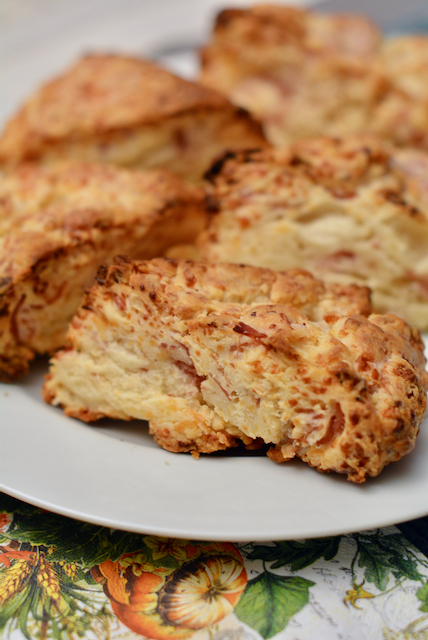 But savory ham and cheese scones are my absolute favorite recipe. I simply make a non-sweet scone dough, add shredded cheese and chopped up leftover ham, and bake them in the oven on a cookie sheet. 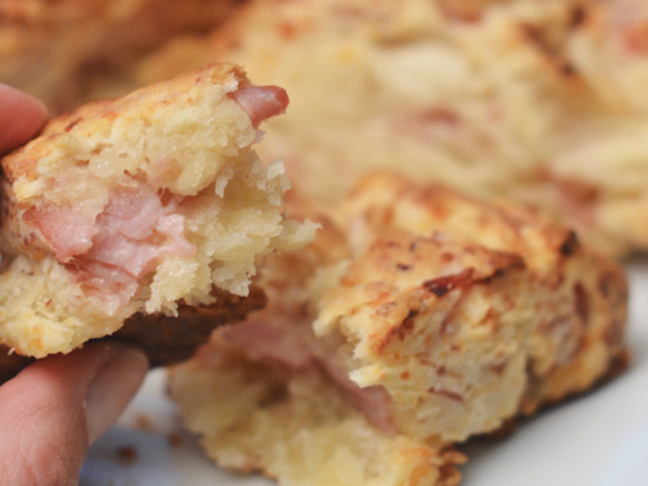 My son says they taste like a grilled ham and cheese sandwich, I think they are more like a breakfast sandwich. Whether served up for brunch with fluffy cloud eggs, or at the lunch table alongside a hearty bowl of roasted red pepper and tomato soup, these fast and simple scones will make short work of whatever leftover ham you find in your fridge after the holidays. Step 1: Preheat the oven to 400 degrees F. Line a baking tray with Silpat or parchment paper and set aside. Step 2: Add the flour, salt, and baking powder to a large bowl and stir it with a whisk a few times. Using your fingers. pinch the butter until the flour mixture until it's evenly distributed and small pebbles form. Then, stir in the cheese and ham. Step 3: Add the cream and fold all the ingredients together with a wooden spoon, the mixture will be lumpy, but make sure it is all combined. Use your hands to form a dough ball. Step 4: Place the dough on the lined cookie sheet and form a disk that's about 1-inch thick and 8 inches round. Brush the top with the remaining tablespoon of cream. Step 5: Cut the disk into 10 triangles and pull them apart so there is about 1-inch of space between them. Step 6: Bake for about 20-22 minutes, or until the tops are nicely browned. Remove and allow to cool. Serve warm.